“What plans do you have for your summer break?” is a question I have been fielding for weeks. People who know me have come to expect an answer that includes some exciting adventure or destination. I take the educator’s perk of two months off seriously and scrimp and save all year long to have enough money to do something special with all that time. Andrew and I have climbed mountains, backpacked into deep wilderness areas, and have even taken a road trip from Paris to Rome. So most people have been surprised when I told them that we are staying home because Andrew is taking a geometry class at UCLA. The minute I say it, I can see that special look in people’s eyes that either conveys empathy for Andrew who suddenly has a tiger dad with unrealistic expectations, or pity for me and my continuing struggle to help “poor little Andrew” break free from his past and correct the mistakes he made in eighth grade. Both reasons couldn’t be further from the truth and I immediately follow up with a “his choice, not mine” statement that always gets a raised eyebrow. A couple of months ago, Andrew heard that one of our friend’s daughters was taking the class and he wondered why someone would choose to give up their summer for a math class. I explained that it could either help you catch up if you needed to or even help you get ahead and end high school with more math classes than most kids. “I want to do that,” was his immediately answer. “Seriously? It’s a six-week class, starts at eight in the morning, lasts half a day, and includes homework!” Incredibly, Principal Dad was trying to dissuade him from ruining his summer with math. “Seriously Dad, I want to take the class,” he insisted. I was thinking, “Well, it’s my money and you better work your rear end off,” but decided to keep that thought to myself. The truth was that I was a bit stunned and incredibly proud of him. He gave up a two-week backpacking summer camp to take a high school level math class and to me it felt like a glacier had just melted off of a mountain to reveal a profound valley in spring bloom. I knew this was there in the depths of his soul and as the awkwardness of his childhood slipped away, I could see the young man he was quickly becoming. I don’t completely blame his teachers for having mixed feelings about trying to corral the impulsivity that Andrew brought to their classrooms. Just five years ago he couldn’t read, write, or even do basic math. Just five years ago, Andrew would pull cell phones out of women’s purses as we stood in lines at the grocery store and innocently ask the stunned women how much they paid for it and did they have good games on it? It was only five years ago that Andrew first sat at my table and I realized that he didn’t even know how to eat with a fork and knife. I can hardly remember that kid, but he existed and he wasn’t easy. So as I watched Andrew walk away from me on Monday morning and into his UCLA math class, my heart was bursting with pride, love, and incredible admiration. This incredibly strong and resilient child of mine was willing to walk into his future with all the confidence in the world. In many ways, it feels like Christmas in the June. After years of so many people telling me that he needed major counseling and every concoction of drugs, I keep hearing the Grinch’s epiphany ring in my ears, “It came without ribbons!… it came without tags!… it came without packages, boxes, or bags!” For Andrew, this day came without drugs, special education classes, or even a good therapist. It came without perfect teachers, understanding coaches, and sympathetic outside adult support. It came because Andrew had two key people who chose to never give up: his dad and, even more important, himself. Spaghetti was one of the first dishes I made for Andrew after he came to live with me. I prepared it, set the table and called him to dinner. Then I sat in horror as he grabbed it with his hands and started to shove it into his mouth. I wish there had been a reality TV film crew on me at that moment as I’m sure the look on my face would have been blasted across the network as the hook to get you to tune into the disaster I was witnessing. Of course, eating spaghetti with your hands is par for the course when you have a new one at home, but not when they are nine! At first, I assumed this was a “spaghetti only” problem as eating spaghetti properly is a hard skill set for younger hands. However, at subsequent meals it quickly became apparent that Andrew had never learned to use a fork and a knife. You don’t really need to learn to use utensils when foraging through a Happy Meal. Andrew was motivated to learn everything there was about living life on the “right side of the tracks” and he quickly learned to maneuver pasta from plate to mouth. Pasta is still a favorite at Casa Providencia and this recipe is really a two-for-one deal. I love pesto and always have an abundance of basil growing in the garden ready for the mortar and pestle. Andrew isn’t as keen on pesto by itself, but loves it with the addition of a raw tomato sauce that also works well by itself on hot pasta or as a topping for bruschetta (a grilled piece of thick crusty bread with a topping). Besides, with all the green and red in the dish, it likes Christmas in June! 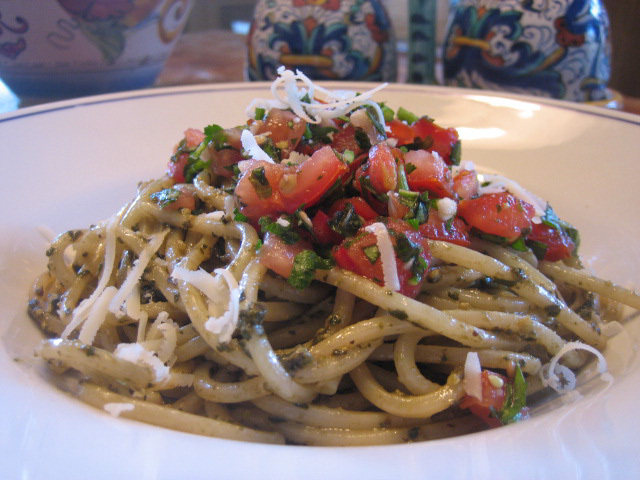 The word pesto originates from the use of making a sauce with a mortar and pestle. In the United States we are most familiar with a pesto made from basil, but equally good pesto is made from arugula, parsley, and other pungent leafy herbs. Pine nuts are the go-to nut, but walnuts are an interesting alternative (especially with arugula). 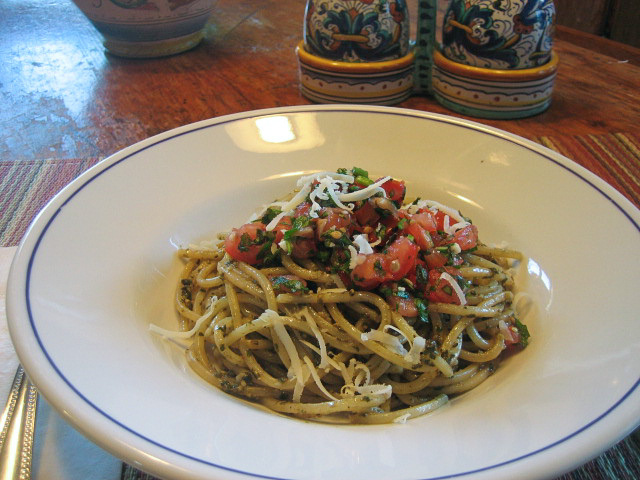 Here’s my basic recipe, but the truth is that I usually measure pesto by handfuls and not measurements. If you like more garlic, add more. If you feel it needs more basil, add more basil. Play with it until you find the right balance for you and your family. If you use a mortar and pestle, you probably don’t need my recipe, so I am giving instructions for a food processor only. Combine the pine nuts and garlic in the food processor and give them a few good pulses. Add the basil leaves and pulse until finely chopped but not mushy. Leave the motor running and add the olive oil in a slow steady stream. Shut the motor off and add the cheeses, a big pinch of salt and a good grinding of pepper. Process very briefly to combine, and then scrape into a bowl. If using the butter (it adds a nice luxuriousness to the pesto), do it by hand and then top the pesto with plastic wrap until ready to use. Note: I used to peel the tomatoes for this recipe, but now just seed them and leave the skins on. 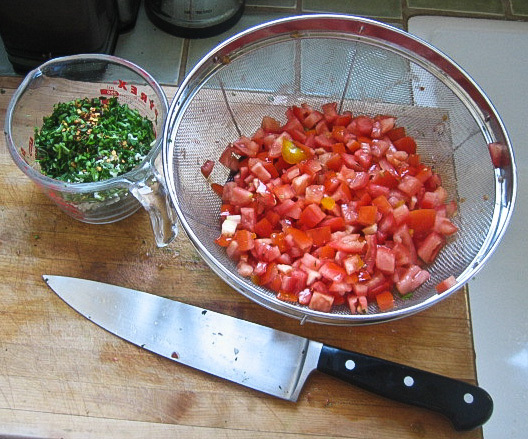 Dice the tomatoes and place in a colander. Salt them very well and toss them around. I use at least a tablespoon of salt, sometimes more. Leave them in the colander for two hours, occasionally shaking them to extract excess water. This step will concentrate the tomato flavor and give you an exceptional sauce. Most of the excess salt is removed in the process, but not all, so you may not need additional salt to finish the sauce. Meanwhile, mix the other ingredients and refrigerate until tomatoes are ready to be added. Serve over hot pasta of your choice, rice, fish, or chicken. Of course, a it’s great on top of a good piece of crusty bread that has been toasted and brushed with olive oil. Love your Andrew story, as usual! What a great milestone in Andrew’s life. Thank you for inspiring all of us to look for and expect the best in ourselves and others. Next post: Guess Who’s Coming (Out) At Dinner?